The Open Waste Management Journal is an Open Access online journal, which publishes original full length, short research articles (letters), reviews/mini-reviews and guest edited single topic issues on all areas of industrial waste management and waste technology research. Topics include industrial waste, residual waste, landfill, waste technology, waste conversion, solid waste management and policy. 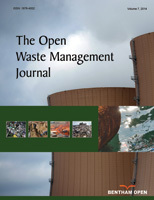 The Open Waste Management Journal, a peer reviewed journal, is an important and reliable source of current information on developments in the field. The emphasis will be on publishing quality articles rapidly and freely available worldwide.